Bed and breakfast accommodation in a separate annexe at the rear of the main house in a very peaceful location. 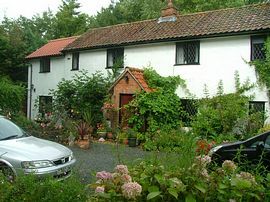 A wonderful place for an East Anglian break, Bed and Breakfast in a traditional cottage situated a few minutes drive from the Suffolk/Norfolk Coast. Foals Grange is a 200 year old cottage renovated and decorated to a high standard. Offering all modern facilities but retains character and tradition. Set within acres of fields orchards and paths our guests will finds miles of beautiful countryside and footpaths both within our grounds and out into the countryside beyond. Our guest are welcome to use cycles free of charge. Cosy and welcoming we like to make our guests feel at home, we offer modern facilities alongside an old fashioned wood burning stove and oak timbered ceilings and floors. For dining you can breakfast in our dining room cosy with woodburning stove. You can enjoy a traditional English breakfast from our extensive menu. £70 per night for room including full English breakfast. Accommodation is situated a few minutes drive from the main A1120 tourist route through Suffolk. Twenty minutes drive to the coast.